I was wonder if what I am seeing for oil pressure is normal on my 1956 88. At start up (engine cold) I am getting close to 40 psi which is the designed pressure output lof the pump. After it warms up it drops to around 10 which is tough to read on my gauge at idle when engine is hot. I dont have any engine knock and oil pressure will jump back up to 25ish when the when throttle is increased. on the 1956 Olds 324 engine. They state normal oil pressure at 40 psi. My 54 runs a little over 40 out on the highway and idles at about 25. Obviously it has been rebuilt at some point but who knows when. What is the oil viscosity? Don't run 10-30. Run a straight 30 wt oil like Castrol high mileage. Maybe even a multi vis. Did you clean the oil pickup screen when the pan was off? If all else fails, increase your idle speed which will increase the pump revs. As mentioned, the oil pressure will be greatly influenced by oil viscosity, engine operating temperature, and engine condition. Lower oil viscosity will produce lower pressure. Higher engine operating temperature will produce lower pressure. An engine with more wear will produce lower pressure than one with less wear. All of these are also somewhat influenced by oil pump capacity and the pressure release valve. My '55 probably has a bit more pressure under the driving conditions you describe, but yours may be O.K. for your circumstances. The easiest ways to increase the pressure is to lower the engine operating temperature and increase the oil viscosity (if your environment's ambient temperatures allow). Just curious. Do any of you with a 55 -56 324 Olds have a oil pressure gauge and the light for oil pump both hooked up. I only have the light and was wondering what the reading of the gauge would be when the light starts to come on. My light sometimes comes on at low idle. I would like to install a gauge. The 54 and 55's came with a gauge and no idiot light. You can install a gauge with your light but it is going to be fun since the source of oil pressure for the light and gauge is on top of the oil filter adapter. It is a nasty job on your back under the car. Thanks - I do not like the idiot light and have been putting off installing a gauge because of the difficulty. I did not know 54 and 55 had a gauge. When you do it that is a good time to do a spin on oil filter conversion. Thanks - I did the spin on conversion a while ago. I guess I will be looking into the gauge issue. I hate adding the gauge cluster aftermarket look though, I would like oil pressure and amp reading . My 1952 Super Rocket 88 has a gauge. When I start it up it climbs to 45-50 lbs at idle. I cleaned the oil pickup screen. Man, was it filthy. Pan too. 36,000 miles, but 40 years in a barn. Just registered it. Although the 54 has an ammeter and temp gauge, I put a voltmeter and temp gauge under the dash on the left side. I have underdash AC and there was no where to put them under the middle of the dash. The ammeter did not seem to be working and I would rather have a voltmeter anyway. The temp gauge does not give the actual temp which I wanted. I also installed an aftermarket 4-way flasher on the left side and a tissue dispenser on the far right. I don't have room for anything else under my dash. The gauges are in separate mounts. 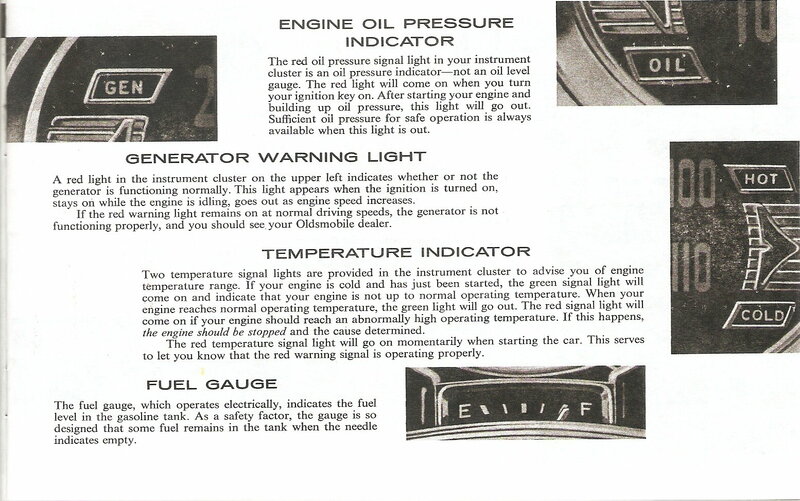 Unfortunately, the 1956 Olds shop manual doesn't provide the PSI values for the oil light's switch as to when the switch opens and then re-closes. I did a bit of a search for the specifications, unsuccessfully. If you'd like to try, the part number is 1508668, and was used, at least, through 1959. Usually these switches open when increasing pressure reaches 5 PSI (or less) and then re-closes when decreasing pressure drops below "about" 10 PSI, but switch variations occur. You could get a better idea of the specs by installing an ACCURATE gauge in parallel with the light's switch. Actually, a light and gauge in parallel may be the best combination when considering loss of oil pressure, due to the awareness factor. Some industrial/commercial engines use an audible warning. Some engines use an automatic shutdown procedure. You could install a "T" fitting on the oil filter base assembly and have the best of both worlds. If that occasional flickering of the red light at idle "bugs" you, you could try switching to a slightly more viscous engine oil, as long as compliance with your environment's temperatures is still satisfied. On a variation on this theme, the manual does provide specifications on your engine temperature indicator lights. The green light (indicates a cold engine) goes out when the engine's temperature (at the rear of the cylinder block) reaches 111-115 degrees on the Fahrenheit scale; and the red lamp will light when the temperature reaches 218-222 degrees F.